Some of my favorite royal tiaras are the sparklers designed for Queen Victoria by her beloved Prince Albert. Today, let's have a gander at the lovely little emerald and diamond tiara that he designed for his wife. The piece was crafted by the jeweler Joseph Kitching based on plans drawn up by Albert. Kitching made the tiara in 1845 for around a thousand pounds. 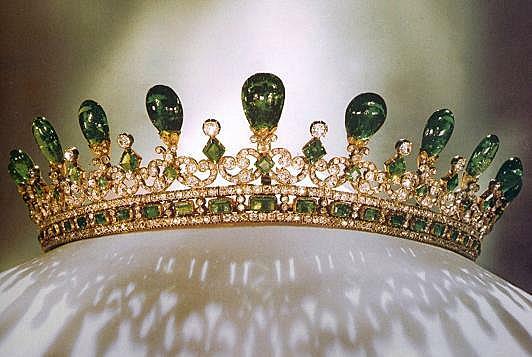 The tiara, which features a geometric base topped by large emeralds, has been identified as one of the queen’s favorite pieces of jewelry. Indeed, she was painted in it twice, most notably by Winterhalter in The Royal Family (1846). But unlike many British royal tiaras, the chain of ownership of this piece is incredibly tricky. The last statement on the current ownership of the tiara came in 2001, when it was photographed for Tiaras: A History of Splendour, the expansive book that accompanied Geoffrey Munn’s exhibit of tiaras at the Victoria & Albert Museum. Munn notes in the book that the tiara belongs to a descendant of Queen Victoria without offering the person’s name. So who was that family member? And how did it get to that person? There are a few bits of evidence that we can piece together to try to establish the tiara’s journey. One of them is a notable omission. We know that it wasn’t a part of the 1896 inventory of the queen’s jewels made by Garrard, which has led some to claim that the tiara was given to a family member before that period. 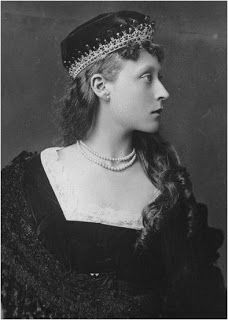 That inventory also omitted other pieces, including the sapphire coronet that now belongs to the Harewood family, so its exclusion from the list does not necessarily mean that Victoria gave the tiara away before 1896. But it’s a good place to start. The tiara appears in a photograph of one of Victoria’s granddaughters, Princess Victoria of Hesse and by Rhine, which was taken in the 1880s. But as Princess Victoria (who was the grandmother of the Duke of Edinburgh) is apparently dressed for a costume ball in the photograph, it’s possible that she was simply borrowing the piece. The links get even fuzzier when you consider that the most recent person to have been photographed in the tiara was from a completely different branch of Queen Victoria’s family: Caroline Worsley, who was the wife of the Duke of Fife when she wore the tiara to the State Opening of Parliament in 1960. (The couple divorced six years later, and Caroline has since remarried.) The current Duke of Fife is a descendant of Victoria through her eldest son, Edward VII; his grandmother was Louise, the Princess Royal. Did Victoria perhaps give the tiara to Louise? 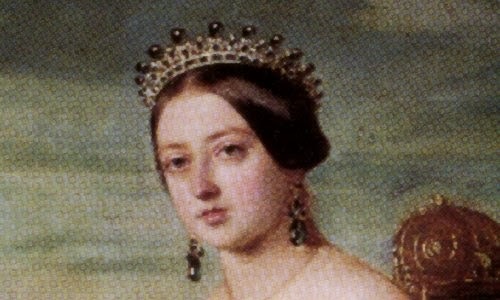 In the photograph, you can clearly see that Caroline is wearing not only the tiara but also a necklace and brooch that look suspiciously like the ones worn by Queen Victoria in this portrait. The fact that the Carnegies may have had access in the 1960s to all three of the pieces leads me to believe that the tiara may still have been in their possession when Munn wrote his book. This branch of the family has been less candid when it comes to the jewels in their possession than some other descendants of Queen Victoria. For example, we’ve only been able to establish that the famous Fife tiara remains with the family based on photographs of Carnegie brides who have worn the piece. With that in mind, it seems entirely possible to me that the duke might not have wanted to make his ownership of this tiara clear. There were major rumors that this tiara was sold and possibly even dismantled in the years following its two most recent public appearances (in a Munn-curated exhibition at Wartski in 1997, and in Munn’s 2001 book). Happily, though, they turned out to be false! The tiara still exists, and it went on display with the rest of the pieces of the accompanying parure at Kensington Palace in March 2018. 1. Detail from Winterhalter's The Royal Family (1846); source here. 2. A version of this post originally appeared at A Tiara a Day in August 2013.